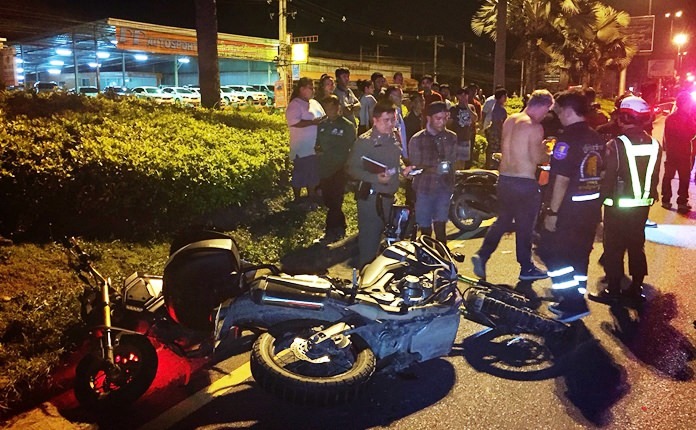 Russian Oleg Volobujev crashed his motorcycle into rescuers assisting others in a different motorbike crash in Pattaya. A drunk Russian driver crashed his motorcycle into rescuers assisting others in a different motorbike crash in Pattaya. Sawang Boriboon Tham­masathan Foundation volunteer Apimon Satornkij was hurt in the March accident on Sukhumvit Road. Oleg Volobujev, 45, and a Thai woman riding pillion also suffered minor injuries. The accident occurred as Apimon and other paramedics were assisting two people on the side of the road hurt in an earlier motorbike crash. Volobujev, driving at high speed, crashed into the Sawang Boriboon truck and two motorbikes. He was charged with drunk driving and faces other charges should the volunteer press them.